Here at Yarwoods Excavator Attachments Ltd, we specialise in the hire and sales of demolition grabs. We have a full range of demolition grabs for sale or for hire to fit machines from 5 tons through to 50 tons. Demolition grabs can be suited for all areas of construction, demolition, waste handling, recycling or scrap. 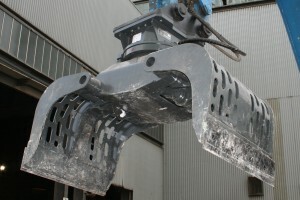 Hiring demolition grabs from Yarwoods is easy as we have a selection of top brackets to fit most machines. Demolition grab sale is an easy process with Yarwoods Ltd. We make sure of that. Here at Yarwoods we have a great reputation for excellence in service and product reliability. We will go the extra mile to ensure that any attachments you hire or purchase from us will give 100% satisfaction whether it be demolition grabs or any other products. Popular models are normally in stock at Yarwoods. Please Contact us today for more information.